Homogenizer Single Stage is a machine that delivers product at a constant rate regardless of restrictive pressure developed between a valve and seat through which the liquid is passing. A single stage homogenizer unit has only one set of valves and is capable of disruption of cells for biological control of a processed fluid. 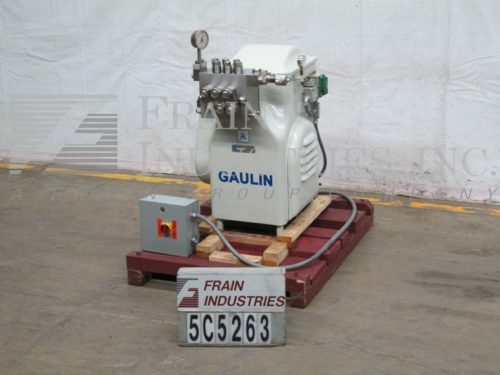 Gaulin, Model 15M 8TBA, single stage, homogenizer. Rated output capacity of 15 gallons per hour – depending on materials and application. Maximum operating pressure up to 8,000 psi. 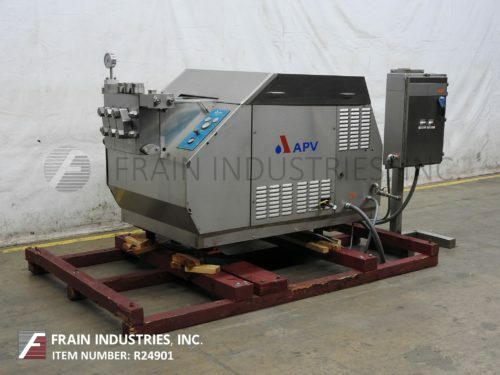 Equipped with ball valve cylinders, manual homogenizing valve actuator assembly with a 6" diameter x 10" deep product hopper, 3 way valve discharge and pressure gage up to 15,000 psi. Ball valve head is ideally suited for high-viscosity or abrasive products like, peanut butter, evaporated milk, wax emulsions and lubricants. 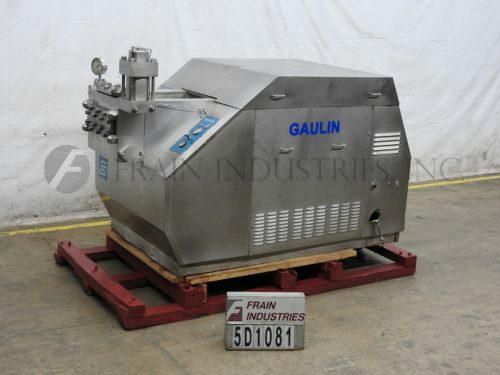 Gaulin, Model 30CD887, single stage stainless steel homogenizer. 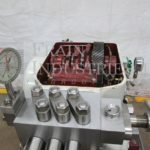 Equipped with ball valve cylinder and CD style valve seat. Rated for an output capacity of up to 30 gallons per hour with a maximum operating pressure of up to 15,000 psi. Manual homogenizing valve actuator assembly with a 1"OD / (3/8)" ID tri-clamp style charge port, 1"OD / (3/8)" ID tri-clamp style discharge port and pressure gage up to 15,000 psi. Ball valve head is ideally suited for high-viscosity or abrasive products like, peanut butter, evaporated milk, wax emulsions and lubricants. Cell disruption valve seat is designed to optimize the extraction of intracellular materials like proteins and enzymes. 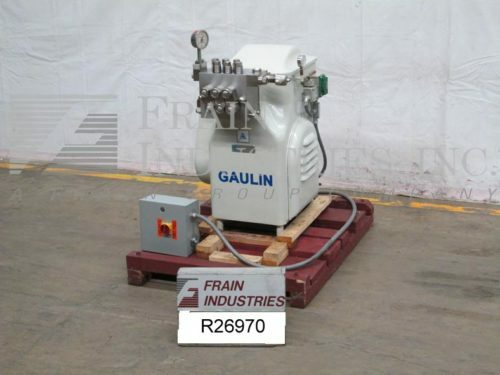 Gaulin, Model 4420 804 15TPN, single stage stainless steel homogenizer. 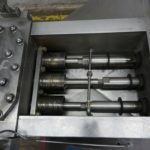 Equipped with ball valve cylinders and standard style valve seat. Rated for an output capacity of 4656 gallons per hour with a maximum operating pressure of up to 1,500 psi. Pneumatic homogenizing valve actuator assembly with a 4¾" OD / 4" ID Tri-clamp style charge port, 2½" OD / 2" ID Tri-clamp style discharge port and pressure gage up to 5,000 psi. Ball valve head is ideally suited for high-viscosity or abrasive products like, peanut butter, evaporated milk, wax emulsions and lubricants. Standard valve seat is used for most emulsion and dispersion applications.